Who are the capitalist folk heroes of our time? 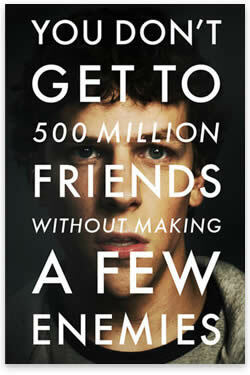 The Social Network is a film that celebrates one of the greats, Facebook founder Mark Zuckerberg. It might seem at first like an impossibly boring story that resists movie making: how Facebook came to be founded and grew, meeting trials along the way and becoming the giant that it is today. In fact, it is not only a super exciting and wonderful movie on its own terms; it is probably the finest movie about free enterprise made in our times. It gets entrepreneurship in the real world exactly right. It deals brilliantly with all the important issues from the motivational drive behind web startups (it is not necessarily money) and the impossibility of slicing and dicing ideas into ownership units. It reportedly mixes fact and fiction, but that does not matter in the slightest for the many lessons and the overall theme. The movie comes just in time. Facebook has been the victim of an increasingly vituperative campaign by the intelligentsia. It supposedly violates privacy, feeds crazed egoism, destroys lives by tempting people to cough up too much information about themselves, wrecks marriages, leads teens to commit suicide, wastes vast time that people should otherwise be using to enjoy the great outdoors, ruins the culture by digitizing communication at the expense of real face-to-face interaction, and wrecks the language by dumbing down the term "friend." Such are the alleged crimes of Facebook, and if you think that the website is guilty, there is an easy answer. Don't use it. Facebook is all voluntary. It is also free for everyone. People — the latest report has 500 million people signed up, but this will grow to 1 billion and beyond — also happen to love it and depend on it. In fact, it is the most popular website ever. It has connected people as never before, allowing one person to keep up with the goings-on of thousands of others in record time. It is a major contributor to the humanization and personalization of the Internet and has made it possible for a vast plethora of causes and ideas to find expression and an audience. There is philosophical significance to the phrase "social network." It echoes a distinction between the economic and political means, as made by Franz Oppenheimer, refined by Albert Jay Nock in his distinction between society and state, and further by Frank Chodorov, who pointed out that the social means is always voluntary and the statist means is always coerced. The Social Network is shorthand for the vast matrix of communication and exchange that springs from human volition alone; it is to "society" in that Chodorovian sense that Facebook owes its energy and orderliness. As always with free enterprise, it all started with a small idea: people like to know about others and like others to know about themselves. The Internet can make this happen. The film shows how the idea germinated within the microculture of Harvard University as Zuckerberg experimented with software solutions, and gathered ideas from every possible source. He rendered dreams into code that became a phenom. The movie nicely illustrates how his entrepreneurship was driven by ideas, tested on a daily and hourly basis in response to consumer interest and demand, with constant refinements along the way. The ideas alone, however, were not enough. They were given life by technological genius. They were implemented through deep devotion and even a praiseworthy fanaticism. The film further shows that, while making money and the profit-and-loss test are the crucial signs and seals of commercial success, in the long run, the drive for money was not the fundamental motivation for the creation of Facebook. Zuckerberg is shown as not caring about money. He cares about doing something creative, great, and pathbreaking. He cares about making a dent in the universe. When Facebook begins to take flight and really catch on, Zuckerberg is quoted as keenly realizing that its popularity, its coolness, is its main asset. He wisely sees that nothing should be done to risk that fundamental asset. The goal is not making as much money as soon as possible but entrenching the love that people have for the thing that Facebook was making available. This attitude among entrepreneurs is far more common than conventional lore would suggest. The archetype is of an achievement-obsessed dreamer, not a greed-obsessed calculator. "The movie comes just in time. Facebook has been the victim of an increasingly vituperative campaign by the intelligentsia." Another point that is bang on in this movie concerns the most difficult life lesson that anyone of singular talent, any dreamer who achieves something wonderful, must learn in life. We are born into this world believing that success in anything will be met with praise and acclaim. We are not often told the truth that we see in this film: success is more likely to be met by envy, hate, disparagement, put downs, and loathing, sometimes from the most unexpected sources. The successful person in any field — and this is probably true in all times and all places — will find himself or herself quickly surrounded by wolves (many of them former sheep) seeking to ruin, wreck, and destroy. Even the grandest achievements are put down as pure luck or credited to others or disparaged as being not so great. If there are laws that give the wolves the opportunity to work out their envy, they will be employed. Every entrepreneur must prepare for this, expect it, and deal with it. So it was that Facebook was met with early challenges and hate campaigns, and it is no surprise in the digital age that the initial attack occurred on the issue of "intellectual property," and here the film makes yet another great contribution. It shows how irrelevant IP is for business success, and how it has become the preferred slogan of losers, and the great excuse for whole classes of people with a bad business sense. "He stole my idea" is the great lie of our time, because ideas cannot actually be stolen and there is no existing idea that is not in debt to some other idea. The film shows how fellow Harvard students Cameron and Tyler Winklevoss had asked Zuckerberg to write the code for their proposed site, Harvard Connection, which eventually became ConnectU. Zuckerberg had other and more elaborate ideas brewing in his brain. Once Facebook took off, the Winklevoss twins cried foul and, after having failed to crush Facebook through every other means, eventually sued Zuckerberg for violating their intellectual property, even though the projects shared none of the same code. There are a few choice lines in the movie. Zuckerberg is outraged at the idea that he had stolen anything. The Winklevoss twins still had their idea; it's just that they didn't do anything with it. And what if Zuckerberg had indeed relied in part on someone else's notion? As Zuckerberg is quoted as saying, does "a guy who makes a really good chair owe money to anyone who ever made a chair?" Silly Zuckerberg: using common sense in the face of the arcane and mixed-up world of IP. Another way to put it is a line Zuckerberg uses in the depositions after the lawsuit. He tells one of the twins, "if you had invented Facebook, you would have invented Facebook." This sounds simple, but it is really all you need to know about the absurdity of such claims. Who wins and who loses in the marketplace is not arbitrary; the marketplace tends to separate the talkers from the doers, the dreamers from the risk takers, the actors from the mere thinkers. If you can't create and can't compete, you can always claim a violation of intellectual property. Hey, under American law, there is nothing you can't use as the basis of a legal extortion scheme. "We are not often told the truth that we see in this film: success is more likely to be met by envy, hate, disparagement, put downs, and loathing, sometimes from the most unexpected sources." An essential part of entrepreneurship is choosing which idea, among the millions that hit a person from every direction every day, one is going to use to influence a business venture. At one point in the film, a student comes up to Zuckerberg and asks him whether he knows if some particular girl has a boyfriend and, if so, how serious they are. This gives Mark the idea of permitting users of Facebook to announce their relationship status on their individual pages. The addition of that one feature convinced him that it was time to go live. The new website was launched soon after. By the standards of IP, the fellow student who asked him this question has some stake in the profits of Facebook, because that exchange gave rise to a crucial feature of the website. For that matter, every single user of Facebook has a stake. By carefully presenting many of the outside influences on Zuckerberg, in a series of brilliant scenes that hit a huge variety of sectors and opinions, the film presents the reality of how ideas come to be, and shows how IP litigation has become a path for losers, a racketeering legal route for the resentful to loot the successful. After all, had Facebook not taken off and been a success, the Winklevoss twins would have never imagined themselves to have been victimized at all. That fact alone shows that there is no real theft involved here. If someone steals your car, you are a victim whether the robber abandons the car or uses it to win a NASCAR race. IP only ends up being an issue when the defendant makes a go of it. Once any idea becomes a success, you can count on hordes of people to line up and claim that they had it first. Sure enough, the twins use the law to extort millions; and who is right and who is wrong — essential matters of justice — don't even figure into the decision to settle. Yet again: this is all too realistic. Especially telling is how the twins imagine how they will destroy Facebook out of resentment for Zuckerberg's success. They make no bones about it: they want to wreck it. Here we see how IP ends up creating a moral hazard for the envious to set up barriers to social and economic progress. I have no idea about the real-life details of the case, but it is possible that the film underplays the extent to which Zuckerberg actually did gain valuable influence from the competitive effort to create the Harvard Connection. And yet, as the film also shows, this is how great ideas come about. No great idea in this world is created out of nothing — contrary to the myth. Great ideas result from the interplay of a huge range of influences in all directions. The winner is the one who makes the commercial reality happen. Until then, it is all talk. A second legal issue portrayed in the film concerns Zuckerberg's squabbles with his best friend, who was named the CFO of Facebook before being squeezed out of the company when the top players, among whom is another legend, Sean Parker of Napster, concluded that he wasn't really up to the job. This case strikes me as a matter of manners and contract but not intellectual property. The case was settled out of court. As EconomicPolicyJournal pointed out, this film could end up driving millions of young, code-savvy students to become entrepreneurs, and further entice students into the world of digital enterprise. More than likely, this is not something people will learn in class. They will learn it from their extracurricular exposure to the fast-moving world of commerce and from developing an intuition about what really makes people tick and how to tap into that in the marketplace. You may not like Facebook, but it has evidently improved life for millions of people. In any case, for decades I've heard the intelligentsia disparage the latest thing, only to find those same people using that very technology a few years later. Today's technology bashers are tomorrow's late adopters. Just the other day, I visited an elderly gentlemen, a prominent fiction writer, in a retirement home. He treats his desktop computer as his lifeline to the world outside, permitting him to keep up with all his extended family and communicate with friends all over the country. My mind raced back to a conversation I had with him 17 years ago. I had asked him what he thought of the Internet and email (there was no web back then). He said that he regarded these innovations as "the end of the world." He said it with an ominous tone in his voice. Well, perhaps he was right about that, but it was also the beginning of a new world that this very person has since learned to love. So it is with Facebook. Zuckerberg ended one world and began a new and better one for many millions of people. The Social Network shows how the commercial marketplace gave a code geek a chance to do that and how he did it. It is a film that celebrates the good guys, ridicules the bad guys, shows the reality of what any successful person will face, makes the legal system look like the pathetic enemy of enterprise that it truly is, and provides a tribute to entrepreneurship that is long overdue. This film is a glorious success — which means of course that it is under attack: A Washington Post reviewer thinks that it doesn't show how private innovation is really just luck of the draw, and it fails to highlight the wonderful essentials of public infrastructure as provided by government. Yeah, sure, and this reviewer might back a similar movie called The Government Network, starring bureaucrats and their defenders at the Post, and see how it does at the box office. Jeffrey Tucker is the editor of Mises.org. Send him mail. See Jeffrey A. Tucker's article archives. Comment on the blog. Just another movie glorifying those who control the media by those who control the media.